A fountain with free flowing vodka? Advertise this and Georgia’s tourism industry will surely flourish, although its seaside location and noted hospitality has also succeeded in attracting top global investors. Georgia’s Black Sea resort of Batumi was once a bleak site: Roads were dotted with potholes, the city was pitch dark at night, running water was scarce and the city’s best hotel was infested with rats. Today Batumi glitters with neon lights and luxury high-rise hotels dot its skyline; soon the city will even boast a fountain flowing with Georgian grape vodka. Batumi, Georgia is reinventing itself as a tourist destination to improve the domestic economy. Photo by Olga. The transformation of the ancient city of 180,000 near the border with Turkey is a vivid example of Georgia’s drive to capitalize on its tourism potential, boosting the economy of an ex-Soviet nation where roughly one person in five lives in poverty. The government has attracted top foreign investors, such as U.S. real estate magnate Donald Trump, to build hotels and develop and renovate tourist sites. And it has aggressively marketed Georgia as a tourism hot spot. Since coming to power in the peaceful 2003 Rose Revolution, the pro-Western President Mikhail Saakashvili has turned the tourism industry into a key sector of the Georgian economy, now comprising 7.1 percent of the Georgian GDP, compared to 3.4 percent in 2004. In 2001, Georgia’s Black Sea towns, the ski resorts of Gudauri and Bakuriani, the winemaking region of Kakheti and other tourist attractions have drawn 2.8 million or nearly 8 times more than in 2004 and tourism revenues have jumped from $176 million to $938 million, according to tourism officials. It remains to be seen whether Saakashvili’s rival, billionaire Bidzina Ivanishvili, who appears poised to become the next prime minister, will continue developing the tourism sector or focus on something else. Today, the center of Batumi could easily be mistaken for a western European seaside town with neat cobblestone streets, graced by vine grapes descending onto the pavement, bustling cafes and noisy fountains. The city skyline is dotted by internationally renowned hotels like the Sheraton and the Hilton; scores of others including a 47-story Trump Tower are being built. At night, Batumi is bright with lights and even the pineapple-shaped palm trees, which line the embankment, are illuminated. The new hotels have created several thousand jobs for the graduates of a recently opened tourism college, a heartening change in a country where the unemployment rate is 16 percent. Restaurants and cafes have sprung up like mushrooms, offering the traditional Georgian dish called of Khachapuri, crusty boat-shaped bread in which an egg yolk floats in melted cheese and butter. And while some skeptics say that the official tourism figures may be inflated, there is no doubt that tourism is booming, with beaches and restaurants busy with visitors. Most tourists come from other ex-Soviet nations like Russia, Ukraine, Belarus, Armenia and Azerbaijan, but English, French and other languages are also heard on the streets. “The people are very friendly, very welcoming, they are always happy to see you. Good job,” Dovrenova said, as she sunbathed at the pebble stone beach. Shi Tang, 29, from China who works as a sales manager at a radio station in nearby Turkey, said he will return to Batumi, which he called a “European city,” with his friends. “This is a good place: good sea, good beach and there are so many churches,” Shi said. 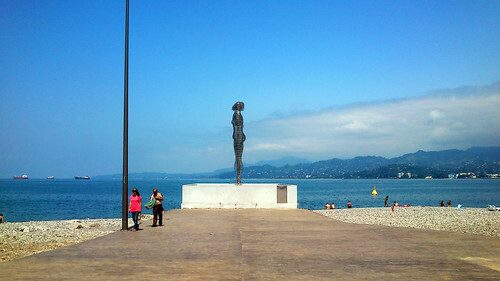 Locals call Batumi “the city of love” and authorities have erected numerous monuments to make the point — like the figure of a man kneeling down before a woman, offering her a red heart. They’ve even opened a round-the-clock marriage registry, where anyone can tie the knot day and night. “A lot of families have been created after the tourist season in Batumi,” Chkhaidze, the mayor, said with a smile. But a lot remains to be done. Step a few blocks away from the city center, and you may stumble into a pothole, see crumbling buildings and underwear flapping in the wind on balconies. Locals complain that water shortages still persist in residential areas and the average monthly salary in the city is just $300. “People are still struggling, but the city is getting better and better,” said Marina Soselia, a 57-year-old doctor in Batumi. Associated Press Writer Misha Dzhindzhikhashvili contributed to this report from Tbilisi, Georgia.